Anchorage Police responded to a shooting with multiple victims that occurred at a residence at the 4100 block of Peterkin Avenue at about 4 PM on December 24, 2016. Upon arrival, officers discovered a male and a female who had been shot. The victims have been identified as Danielle Brooks, 32, and Christopher Brooks, 38. Danielle Brooks was pronounced dead at the scene. Christopher Brooks managed to exit the residence, but collapsed outside; he was transported to a local hospital where he died a short time later. A six-year-old child, who was inside the residence at the time of the shooting, told police that “Ninjas came to my home and killed my family.” Family members now have custody of the boy. Detectives worked throughout the evening and into the night piecing together the events that led to the shootings. The investigation revealed that several men, who knew Christopher Brooks, planned on going to his residence with the intention of robbing the couple. During the robbery, Lamarkus Jayquann Mann, 22, produced a gun and shot Danielle Brooks; a struggle over the gun ensued resulting in the shooting of Christopher Brooks. The robbers fled the scene in a vehicle. During the course of the investigation, detectives determined that Jaylyn Franklin was amongst the group that robbed the couple; he was taken into custody and charged with Murder, Robbery, Burglary, and Tampering with Evidence. He is being held without bail at the Anchorage Jail. 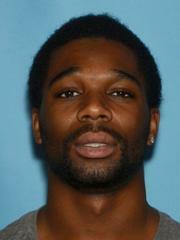 Detectives are looking for Lamarkus Jayquann Mann who has a warrant for his arrest for Murder, Robbery and Burglary. Mann is considered armed and dangerous; if you have information as to his whereabouts, call 911. Anchorage Police are investigating a homicide that occurred at the 4100 block of Peterkin Avenue at about 4 PM this afternoon. No suspect is in custody at this time. This investigation is in the very early stages; additional information will be released as it becomes available.